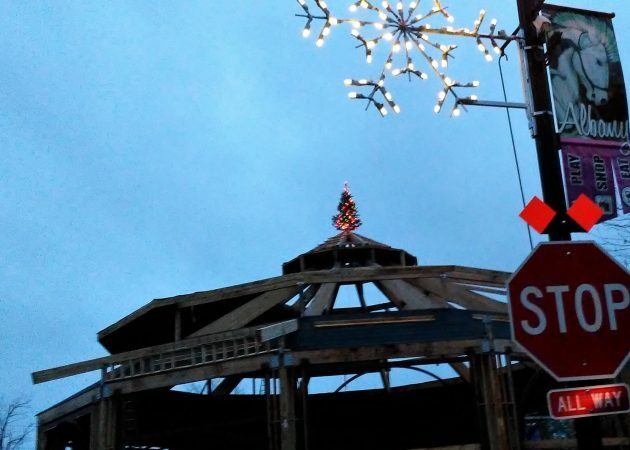 It was nice last week to see that the crew building the Albany Carousel had observed the ancient custom of “topping out.” When they had finished framing the roof, they crowned the peak in a fashion fitting the season. The lighted Christmas tree up there looks kind of little from the ground. But only looks small in comparison with the size and height of the building. It’s a 10-foot tree, I was told by Matt Bennett, who runs the famous Sybaris restaurant across the street and watched it go up. Topping out is an ancient custom in the construction industry that goes back a thousand years or more to the people of Scandinavia, according to a 1984 story in the New York Times I found online. It takes place when builders finish framing the tallest part of a building — whether it’s a skyscraper or a house. The symbol that is used takes various forms: green wreaths with colorful ribbons in northern Europe, boughs or green trees in this country, and often now a flag. But you’ll agree that the people of Gerding Builders who are putting up the $5.4 million home of the carousel at First and Washington picked the perfect symbol for this time of year. A flag! How nice. We’re not Corvallis yet! Tree with lights is nice. Replaced with a flag you say? One wonders if it will be the red, white and blue of Russia!